What brought you to Atlanta? How does this city contribute to your practice? I first came to Atlanta in 2008 from Baltimore. It was an opportunity for a change of scenery. From the very beginning I felt embraced by the Atlanta art community. I have now lived in Atlanta longer than any other place in the US. It is within this Atlanta context that I grapple with the various ways my own migration to the US has added new complexities to my understanding of cultural and national identity. Over the years I have watched Atlanta grow, particularly with an influx of immigrants. I would like to think my own conceptual grapples with cultural identity coincide with a city figuring out who it is and who it wants to be, especially under the current administration. Both 2018 & 2019 are shaping up to be busy years. I recently received a Working Artist Project award through the Museum of Contemporary Art Georgia. The award culminates with a solo show at the museum in 2019. Also I am one of 32 artists participating in the Drawing Center’s 2018-2020 Open Session. 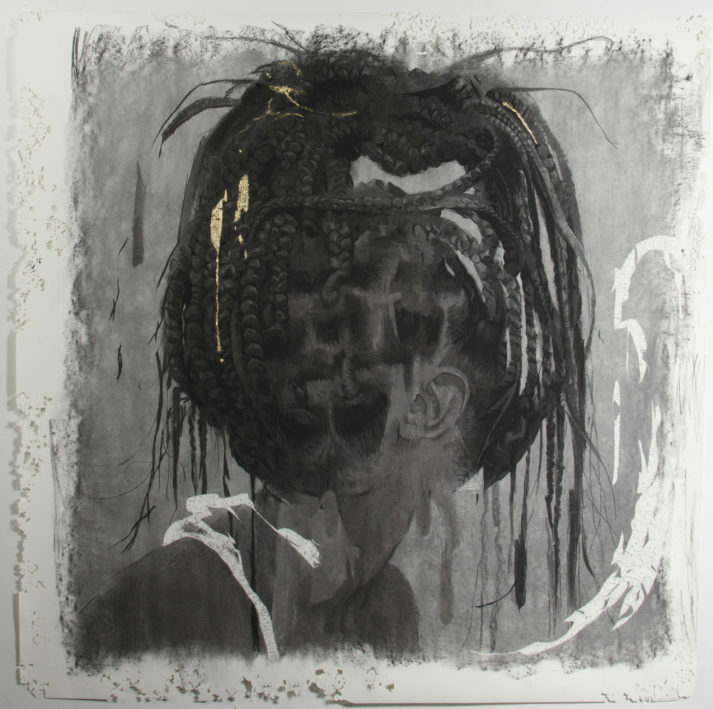 Your work focuses on how “notions of identity are disrupted by migration — particularly migration as an unfinished arc of motion whose final resting point remains an open-ended question…” Do your own identity and experiences as an immigrant from Jamaica to the United States influence your work and, if so, how? What are some other major influences for your work? My creative process begins through the interrogation of my own (racialized as black, gendered as man) body, and the personal memories and histories that are embedded within it. I use this archive as my entry point into collective political interrogations. My interest in migration (which predated the current administration) grew organically from my own experience and I use that as a means to ground the work in something that feels vulnerable and authentic. I am also fascinated by the potential of migration as disruption to the rigidity of nationalism. Politicians and conservative pundits have historically articulated migrations, particularly of black and brown people, as an existential crisis to national and cultural identity. I try to be constantly reading, though with my schedule I am not always successful. Some of my biggest influences of late have been the writings of Stuart Hall, Achille Mbembe and Christina Sharpe’s In the Wake. How do you decide on a medium for a work and what role does it play? Do you consider the viewer’s response when making this choice? Each medium has its inherent strength and weakness. Understanding those strength and weaknesses goes a long way in my decision process. During the creative process, I often ask myself- what is the best medium to articulate this idea? What kind of conversations will happen between the various mediums and even physical space between the pieces? How will the various mediums assist or complicate the viewers interpretation of the work? How do you negotiate between your own intentions and the way the work is perceived? I take it case by case. There are times when I feel I need to recalibrate and be more intentional with my metaphors and then there are other times when I feel the viewer needs spend more time with the work. The analogy “Art is a marathon” is often employed to articulate how young artists should approach their work ethics and success, but I think this emphasis on the long game is also helpful in understanding how one’s work will exist in the world. Sometimes there are pieces that demand being created even as I don’t fully understand how they fit in my larger interest. When you are creating a body of work you want a certain level of cohesion, however I am also aware that there is a larger meta narrative actively being woven, with overlapping themes that will only be revealed with time. What were you working on when you received the Artadia Award in 2016? How has your work evolved since then? In 2016 when I received the Artadia Award I had just completed a body of work for a group exhibition entitled Beautiful Tangle. For that body of work I was looking at the complicated and often contradictory relationship between Jamaica and Britain. In 2015 the then UK Prime Minister James Cameron visited the island. I used the official transcript from his contentious address to Jamaica’s sitting House of Parliament as generative material for a body of work. Prime Minister Cameron came with the intention of building prisons on the island to house the Jamaican citizens serving sentences in Britain, while the then Jamaican Prime Minister Portia Simpson wanted to discuss reparations for atrocities committed under British colonial rule. As you can imagine there was a great deal of tension, further exacerbated by Prime Minister Cameron, stating that therewould be no apology issued (despite a 2013 £19.9m reparation settlement to more that 5,000 Kenyans). Since the 2016 Artadia award, my work has oscillated between exploring the contradictions in post-colonial identities and the various ways migration complicates cultural and national identities. Cosmo Whyte was born in St. Andrew, Jamaica in 1982. He attended Bennington College in Vermont for his BFA and the received an MFA from the University of Michigan. His work has been exhibited in the US, Jamaica, Norway, France and South Africa. In 2010, he was the winner of the Forward Art Emerging Artist of the Year Award. Whyte received an Artadia Award in 2016. That same year, he participated in the Atlanta Biennial followed by the Jamaica Biennial in 2017. Whyte is based in Atlanta, Georgia and Montego Bay, Jamaica and is is a professor at Morehouse College. For more information about Cosmo, please visit his website and his artist registry page. Images: Header portrait by Jamie Hopper. Courtesy of ARTSATL. THE ENIGMA OF ARRIVAL IN 4 SECTIONS. SECTION 1: GUESS WHO IS COMING TO DINNER. 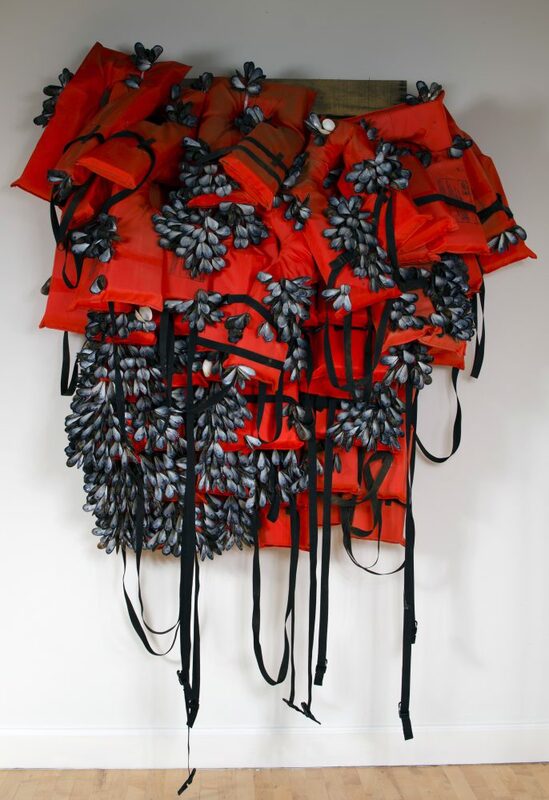 Mussel shells, life vest on shipping pallet, 5.5ft x 3ft x 1ft. MOTHER’S MILK. 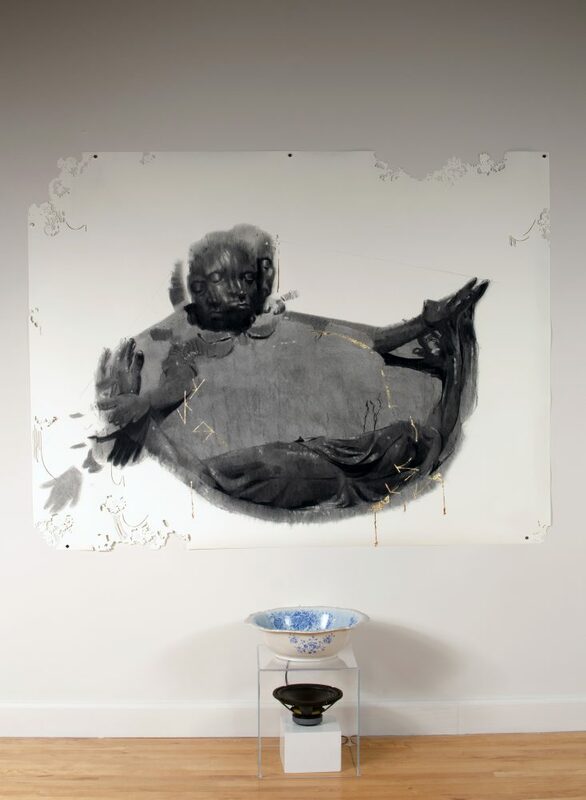 Charcoal and Gold leaf on paper, Ceramic Vessels, Speaker, Amp, Rum, Mussel Shell, 74 x 80 ft. KISS MI NECK BACK. Charcoal and Gold leaf on paper, 52 x 51 inches.